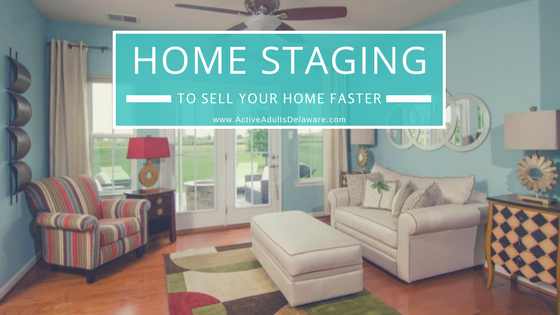 Home staging sells homes faster and for more money. When Active Adults Realty lists a home for sale in Delaware, we always include home staging as part of our Listing Program—at no additional charge. This is not something all REALTORS® do but it is so important. We are not talking about a Staging Consultation which provides you with a list of things recommended you do to sell your home. We are different because we actually bring our home stagers into your home and perform an “instant makeover” right along with you. One of our real estate agents, Donna Beck is also an Interior Designer and Staging Consultant. Donna works with homeowners throughout the state, and even out-of-state, to give staging tips and insights which help homes sell. What Donna discovered is by viewing listing photos online for an out-of-state client she could make a few suggestions—helping their home sell faster and for more money. Sometimes the reason a home does not sell is that it is overpriced but professional home staging and photography can often attract more notice, more showings, and a quicker sale. “’Clutter be gone.’ Well, if I was Samantha from Bewitched that might work, but I’m not, so this is your plan before the photographer arrives,” Donna says. Remove all clutter from the kitchen counters—if only for the photos. You need to grab their attention from the first photo. Remember, home buyers are sitting in front of a computer; if they don’t like what they see after three clicks they move on to the next home. Cluttered rooms look smaller to buyers. Since you are moving, this is a great time to pack up your personal photos or excess items. You may not even realize how cluttered an area has become. A fresh set of eyes from your home stager helps you to see what can stay and what needs to be packed away. Remove all area rugs for the photographs. Hallway runners or large area rugs are fine. Remove any rug that is 3′ X 5″ or smaller. For the photos, roll them up for storage in a closet. Turn on every light for every showing. Your objective is to make your home look light, bright, warm, and welcoming. Nothing is as inexpensive as lighting to create a cozy, inviting ambiance. Let your agent or the showing agent know that you will also turn them off. Sometimes agents have a full schedule and do not have the time to turn on every light then turn them off again. You do and your help will be appreciated. Paint colors and flooring choices. You may have loved that lime green bedroom, navy blue wall, or persimmon ceiling but buyers may not. The objective is to reach as many buyers as possible. This happens when the walls and flooring are a neutral color. Please do not install new carpeting without consulting your REALTOR® to get some insights to hot demand colors and what’s on buyer’s must-have lists. Take beige, for instance, you may not like it but, I promise, buyers will. When buyers see beige they think “this is one less thing I will need to change.” Did you know the new vinyl plank floors are being installed more frequently than carpeting, real wood, or engineered wood floors? Whether you choose to follow this will depend on your budget and your interview with your listing agent. Your REALTOR® keeps current to what’s hot and what’s not because this is what we do for a living. We know what items buyers are looking for in their next home and we can advise you if anything in your home should be updated during our listing appointment. Replace old appliances with stainless steel appliances. Updating your appliances will make a difference even if your cabinets and countertops look a little dated. Brighten your bathrooms with color-coordinated towels, scented soaps, or candles. Bright, clean, luxurious baths sell homes. Bathrooms are the second most important room in a buyer’s decision to buy. When choosing scents be careful to not have too much scent. Lemon, lavender, vanilla, and grapefruit scents are popular and less overwhelming. Weed and water the yard. Replace dead plants, bushes, and sod, etc. Hang ferns or other ornamental plants to add warmth to your front porch. Hang a wreath on the front door, if possible. Place potted plants in and around the entrance. These are ideal because they can be moved and rearranged as necessary. Fix broken lights and fixtures. Remove cobwebs and power wash the entryway, if necessary. If your doormat is worn get it cleaned or replaced. Unless you are selling a haunted house, get rid of creaking doors. Creaking sends a message that this is a tired, old house. While each of the tips given will have an impact, resist compromising on any of these must-do items. These next tips are essential. Don’t forget to have all of your windows cleaned. Buyers eyes automatically go to any slider or window with a view. Make sure these focal points are clean. Remove the screens in these windows to optimize the view. If shrubs are obstructing a view, have them trimmed below the window height or thinned out. Do have the carpets, drapes, and upholstered furniture professionally cleaned. No pet odors or any other foul odors should ever greet a buyer who walks through your front door. Do not allow ANYONE to smoke in your home. Once you decide to put your home on the market your home needs to remain smoke-free. Do not cook with strong herbs, spices, or strong odor foods. Be mindful of cooking scents in the days before a showing or home tour. For instance, fish can leave bad odors behind the next day. Do add cedar chips to your basement, closets, under sinks, or any area that has a musty smell. Musty smells linger and you need to address these areas. ABSOLUTELY no mothballs (don’t laugh, people still use them). Do add a box of baking soda to your refrigerator. If you cooked something with a strong odor and refrigerated the leftovers the strong smell will be here, too. Don’t forget the garage. If your garage is overflowing with bikes, tools, pool toys, it sends the message that this house has no storage. Either rearrange it to eliminate that perception or rent a storage unit until your home sells. If your garage floor has epoxy, congratulations you are in the top 1% of homeowners who finish their garage floors. If you have a painted garage, even better; this too is a nice touch that buyers notice. Don’t forget to make sure your garage door is operational and clean. No squeaks here when the buyer hits the open button, either. Oil all moving parts before you put it on the market. And lastly, remove the pets. I know little Fido sees him/herself as your guard dog but buyers might believe that bark or growl and get distracted from what they are at your home to do. The buyer is here to spend time looking at everything and writing an offer, not being concerned about a pet being introduced to a group of strangers. Whenever possible, have a neighbor dog sit, or make other arrangements aside from leaving Fido in the garage or spare bedroom. When listing your home, Active Adults Realty always hires a professional photographer. You will never see any cell phone photos on our listings. We use these same professional photos to create a virtual tour, brochures, internet advertising for your home. This is at our expense as part of our marketing plan to get your home sold quickly. I sincerely hope your Listing Agent where you live now has the same approach as we follow. Remember, you hire us to: Sell your home quickly and for the best price possible so you can move on to the next chapter of your life. Home staging is a very important step in this process. If you are planning to list your home for sale in Delaware, call us at 302-424-1890 for a Listing Consultation or request our free Seller’s Guide HERE.